All transactions are safe and secure with a reliable history in online purchasing behind each of our associates. 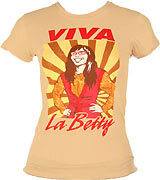 Buy the Viva La Betty t-shirt to own Ugly Betty clothing and merchandise. Long Live Betty! The fronts of these America Ferrera Ugly Betty t-shirts feature a colorful drawing of the actress in her Golden Globe winning role. The sun's dark rays can be seen shining out from behind her and the phrase, "Viva La Betty" encloses her on the top and bottom. In English, this phrase means "Long live Betty." It is a play on the familiar Che Guevara associated phrase, "Viva La Revolucion." Wear this tee with a Mode Magazine Ugly Betty hat. In addition to the Viva La Betty tee above, browse the Ugly Betty Clothing Gallery for more apparel like men's and women's clothes, kids shirts or hoodies.